Research on “all” historic American saddles, horse equipment, 19th century leather, military saddlery, wagons, stable requisites and other miscellaneous. NEW BOOK!! IN STOCK NOW…TIME TO ORDER! See the “STORE” on this web site to order yours! www.americansaddles.net (icon below) or click on the FACEBOOK icon (above). BOOK SIGNINGS? : Contact Ken Knopp at kenrknopp@gmail.com. Hard back, full color throughout! Nearly 300 pages with over 650 illustrations. Meticulously researched and fully footnoted! Expect quite a bit of new research information that confounds heretofore general knowledge of American saddlery along with photos of never before seen saddles from private and public collections. Gorgeous and rare Spanish saddle c. 1840’s to early 1850’s made by Dicks & Waters of Natchez Mississippi. NOTE: I am very proud to announce…..that historian B. Bryon Price has written the Forward. Mr. Price is no stranger to the subject matter. He has written, edited or co-authored over twenty books on the American West including “Saddles of the Frontier West”, “Fine Art of the West”, “Cowboys of the American West” and “Cowboy Spurs & their Makers”. In addition to television and movie consultant work, Mr. Price was former curator for several renown western museums including the National Cowboy Hall of Fame and Western Heritage Center in Oklahoma City, and the Buffalo Bill Historical Center in Cody, Wyoming. Currently, he is the Director of Charles M. Russell Center for the Study of Art of the American West at the University of Oklahoma and is the Director of the University of Oklahoma Press. 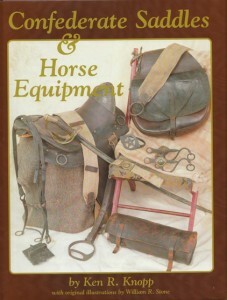 Book Overview: AMERICAN RIDING & WORK SADDLES (and Horse Culture), 1790-1920. It encompasses all the major American “non-military” riding and work saddles. The effort is to provide the origins, history and development of the major American “riding” and “working” saddle patterns, the saddle making industry and the American horse “culture” relative to our great country’s history. This will include the origins of their Spanish and English influences and the story of the rise and demise of American saddle manufacturing from the late 18th through early 20th centuries. This is NOT an effort to recapture the military saddle. That has been done quite well by others. 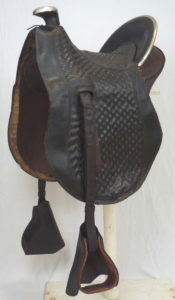 Rather, it will cover all other major American saddle patterns: Spring seat, American, English, Wagon saddles, Somerset, Attakapas, Spanish, Half Spanish, Hope, Texas, California, Kilgore, Morgan, Morgan Muley, Kentucky Spring Seat, Wilbourne/Buena Vista, multiple Stock “Cowboy” saddles (Texas, Cheyenne, Pueblo, Miles City, Applehorn, etc.) 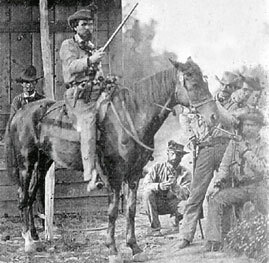 and their California (o) influences, Ladies side saddles, Ladies Astride saddles, Princess saddles, Children’s/Youth saddles, Park & Police saddles and, commercial military saddles. Many others including some well known national commercial patterns and regional makes will also be included (Shaftoe, Shackleford, Granger, Ferguson, Race, Polo and Pad saddles,….McBride, Richardson, Ferguson, Florida, etc. ). Other historical topics related to the saddle manufacturing industry are covered as well: trees, leather, hardware, patents, manufacturing #’s, exports/imports, influential persons and regions, etc and,….The “Golden Age of the Horse”. Yes, a massive undertaking! Of particular note will be inclusion of excerpts from the VERY FIRST American saddle catalog, The T. Smith & Co. catalog c. 1858, (today: Smith Worthington) made up of water color saddle illustrations commissioned by the iconic Hartford Connecticut saddle making firm. The saddle patterns and styles that were offered by this firm prior to the Civil War are incredible and will most certainly stand conventional wisdom and understanding of pre-war saddle patterns, on its head! The breadth of this project is extensive including over 650 saddle photos and illustrations to enable one to identify 19th century saddles. As Always, Check out my saddle and horse equipment photos in PHOTO GALLERIES! The ONLY place on the web to see such a wide assortment of “Pre-1900” saddlery! In addition, tons of photos of civilian saddles, bridles, bits, stirrups, etc. ; Confederate and Federal Saddles, Confederate/Federal Horse Equipment, Dragoon and Indian War saddlery; photos of CW artillery teams, artillery horse equipment, quartermaster wagons and ambulances; mounted Federal and Confederate Cavalrymen and more! All from public and private collections, some have NEVER before been published or seen the light of day. Over one thousand photos! CHECK OUT MY OTHER WEBSITE: americansaddles.net HEY! my book, MADE IN THE C.S.A. SADDLE MAKERS OF THE CONFEDERACY is OUT OF PRINT and ALMOST OUT OF STOCK!!! Right now I have only a very few left! On Ebay these go for $60! From me… ONLY, $48 plus $8 shipping. Look under “Ken’s Books” Soon out of inventory! LESS THAN 10 REMAIN! Better get it now while they last. They will NOT be reprinted! 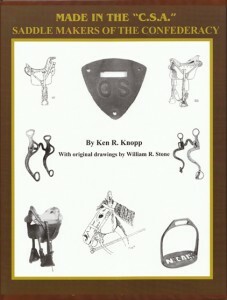 The hardbound CONFEDERATE SADDLES & HORSE EQUIPMENT still available at “full” price of $55 plus $8 shipping (USA only). Signed copies available.